I’m excited to race at Northampton again and to see how the track has improved since the last time we raced here when it was like being in the Sahara Desert. I took a look at the track and noticed straight away that it looked so much better, credit to Deane Wood and the team for the improvements. Heat 1 was the Trust Fund Race, also known as the Red Top Race, this got me very excited as I felt very cool being in a red top race! However, I didn’t even managed to do a lap as a blue top climbed all over the top of me on the first bend, bending my front axle and steering arms, I tried to carry on but had to pull off after a couple laps as I could hardly turn the car. Bit disappointed as I didn’t even get chance to see how the car was handling and also means that I will be in the Consolation. 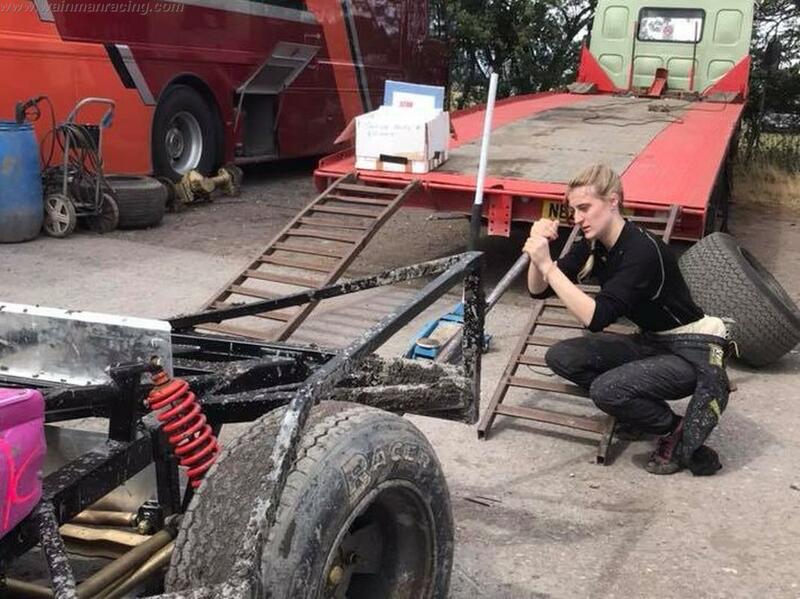 We managed to straighten my front axle and steering arms in time for the Consolation, and I was going really well until a blue top took me out by driving straight into the side of me coming out of the bend. It was the same one who took me out in Heat 1 too! I managed to carry on and finished in tenth, however only the top 8 went through to the final so I just missed out! I was lucky to get into the Grand National as I was the last car allowed on track due to there being too many drivers. My brother and dad didn’t manage to get in but at least they got to watch me! I was going well and really enjoyed myself, I finished without a place but was really really pleased with how the car was handling as this is my first time out on shale in it! Even though I didn’t get the best results, I am very pleased with how the car performed in the few laps that I did and I cannot wait to race tomorrow. On Sunday morning, everything was absolutely drenched, it had pretty much rained all night and all morning and the track looked like it was feeling very sorry for itself! 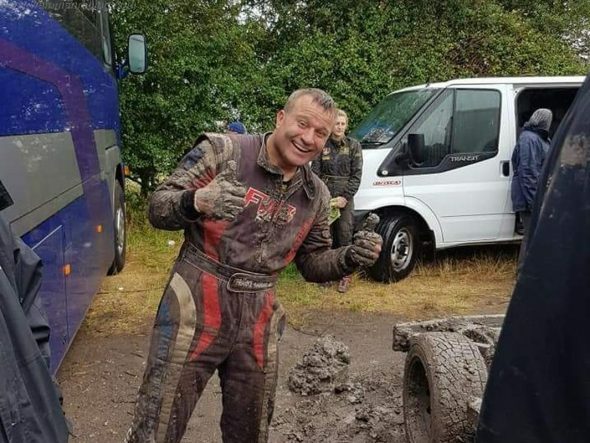 I wasn’t really looking forward to racing in these conditions, I knew that the track had clay in it which, when mixed with rain, is disastrous! And to make it even worse, I left my waterproofs at home! On the rolling lap of Heat 1 I could feel that I had little control over the car, I was trying to keep the car straight but it was voluntarily drifting towards the infield. A few cars actually pulled off on the rolling lap because it was really hard to drive on it, let alone race on it! As soon as the green flag dropped, the race didn’t get any faster. Yes the track really was that wet and slippy! I did a few laps before I got tangled up with another driver, the clay was so thick that I couldn’t set off, I managed to pull onto the infield, which took me about 45 minutes….! And stayed the rest of the race on the infield as I could hardly get my car to move! 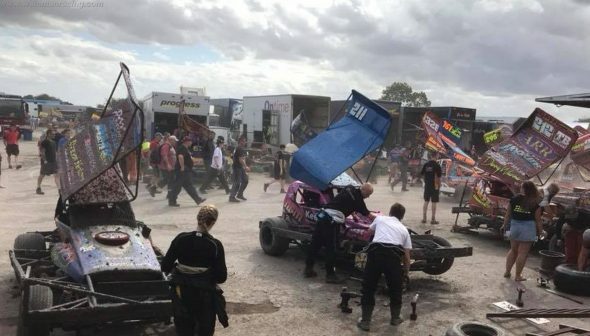 The Consolation and the European were both cancelled due to the condition which the track was in and the fact that they just couldn’t hold a championship race on the track, so the European will now take place the day after World Final at Northampton. The Final and Grand National for today however were still going ahead. The track had actually dried out a bit by the Final, there was a nice dry line on the inside but as soon as you went a bit wide and into the thicker stuff, you really couldn’t get out of it. My car felt really good and fast, I was running sixth with 2 laps to go when a Dutchie took me out. I got into the thick stuff and couldn’t get myself out to finish. I was really gutted as this was the first time all weekend that I was actually getting the hang of my car but hopefully I will be able to get a good place in the National. The National was a good race, the track had turned very bumpy and I didn’t want to destroy my car so decided that slow and steady was probably the best way for me. It turned out that it actually was the best way for me as I managed to finish with seventh place which I was very chuffed with as I needed some points! 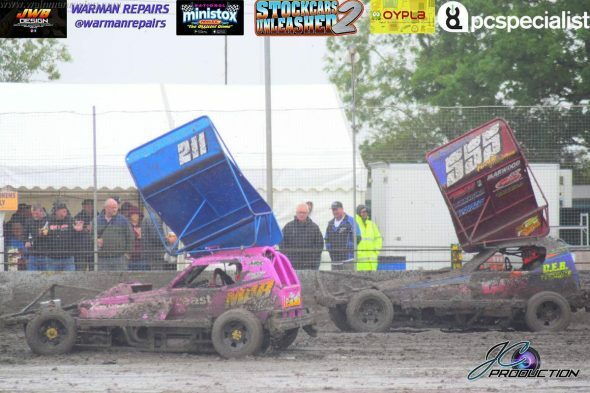 I am really pleased after this weekend as I now know that my car does go well on both shale and tarmac meaning that it will be a brilliant dual surface car which was what be built it to be. Just my quick opinion in relation to the track. I believe that Deane Wood is doing a very good job and is doing all he can to help the sport and doesn’t deserve some of the stick that he is getting from both drivers and spectators. However, the reason that we don’t have clay tracks in England is because it rains 99% of the time. Most tracks in New Zealand are made from clay which works because it only rains a few days of the year over there and as soon as it does, the meeting has to be cancelled due to how slippy clay gets when wet. I know that the weather cannot be helped but hopefully now the clay will be taken off and shale put down instead. 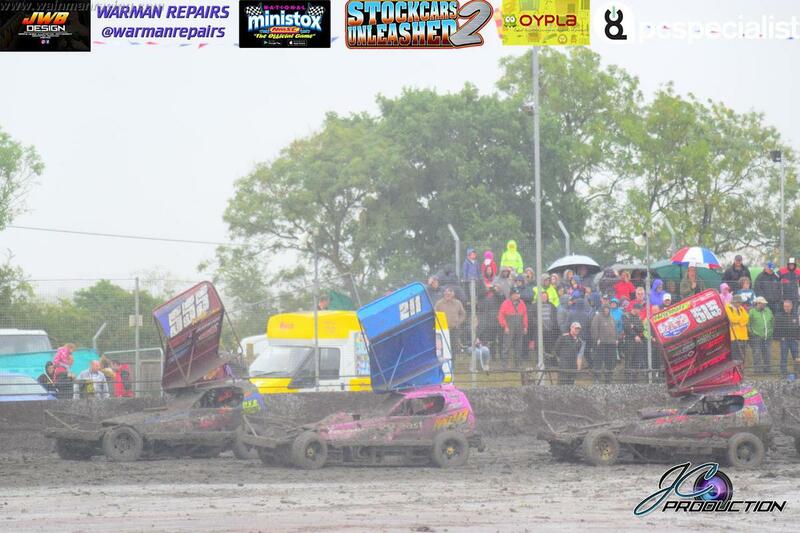 I am still excited to go back there and race again to see how the track has been improved again, but people need to need to realise that shale tracks cannot be made overnight, it will take a good season of racing on the track for it to settle before it becomes a nice smooth shale track.